The ENTERTAINER Malaysia 2017 app was launched recently, offering over 1,200 Buy-One-Get-One-Free offers for restaurants, cafés, hotels, attractions, spas, retail & many more, which customers can purchase for RM145.00, directly from their website or through the ENTERTAINER App! If you've purchased last year's ENTERTAINER 2016 voucher book, you'll know the extent of the vouchers available that you can't even finish using all of them! This year, instead of having hard-copy voucher books, all you need is to have the ENTERTAINER Malaysia 2017 app. This year, the ENTERTAINER is proud to introduce Cheers Malaysia 2017, a Buy-One-Get-One-Free app exclusively redeemable on drinks in the hottest bars and restaurants. Offers range from single beverages to bottles of wine/ spirits/ buckets of beer, double cocktails, pitchers and more. A vast variety of popular venues such as Jiro KL & Hugos Modestos are part of the participating venues. To celebrate the launch of this perfect match, the ENTERTAINER held a launch party at Jiro KL in Bangsar. The evening was filled with excitement, lucky draws, pop quiz & fantastic prizes we given away to winner as well. The first 100 invitees who turned up at the party also walked away with a swag bag filled with vouchers & goodies from the event's sponsors. With up to RM415,000 in savings for customers in 2017, this app is sure to be a hit for all who eat out, drink out, & spend much of their time out with family & friends! Offers are available at venues across 40 destinations in the Middle East, Asia, Africa and Europe as well (you'll need that country's app to purchase offers for that country). Blanc Coco is the WORLD'S FIRST 100% sparkling coconut water & was launched last week in Malaysia by Euro-Atlantic Sdn Bhd for Thai Coconut Public Company Limited! Yes, our country hosted the launch of the world's first 100% sparkling coconut water! This unique & refreshing thirst-quencher is rich in nutrition & comes from the best type of coconuts, the Nam Hom variety that's grown in the Ratchaburi Province of Thailand. The Nam Hom coconut is known as "The King of Coconuts" & is reputed to be the best in the world. It is harvested at the young age of 30 days old for its sweet coconut water. Its one-of-a-kind fragrance makes the Blanc Coco 100% Sparkling Coconut Water, which you'll never find in any other species of coconuts. At present, there are 4 flavors of Blanc Coco 100% Sparkling Coconut Watter - Natural, Pomegranate, Mango & Pineapple, & Lemonade. As Malaysia is the 1st country in the world to have the Blanc Coco 100% SpaCoconut Water, Thai Coconut Public Company Limited will soon be launching this unique drink in Japan, Korea, Australia, New Zealand & also the United States. 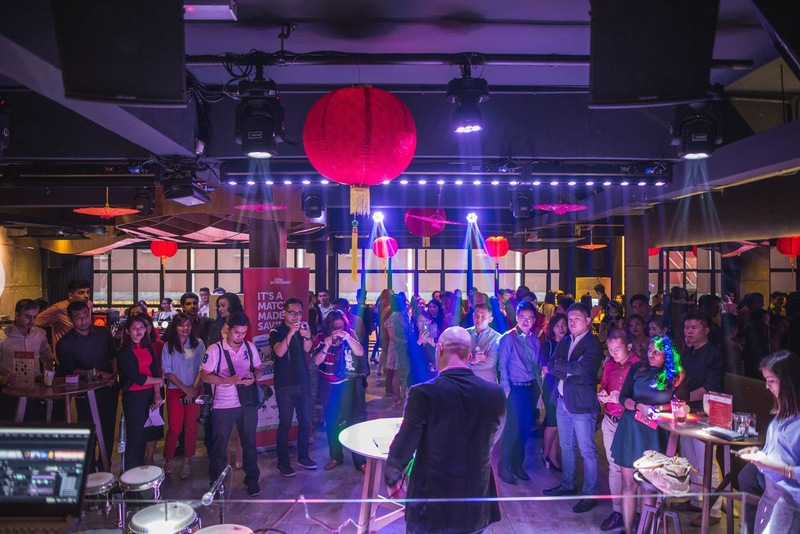 The launch took place at Samplings on the Fourteenth, Berjaya Times Square Hotel Kuala Lumpur. There were welcome speeches, cutting of the launch ribbon, followed by a short media Q & A before the media representatives were ushered to a Thai-sampling dinner. Thai Coconut Public Company Limited also produces coconut milk beverages in 6 different flavors i.e. natural, durian (flavoring, not using actual durian), mango, melon, chocolate & coffee. They also produce Thai Coco snacks such as the Coconut Chips in original flavor, sour cream & onion, yoghurt, & spicy cheese (not available in Malaysia yet), plus Roasted Coconut Bars as well. The melon flavor was very evident. This flavor isn't my favorite as I found the melon taste stronger than the coconut taste. There's no doubt that this is a durian flavored beverage. It's not overly pungent, but reminded me of durian ice-cream! I thought this was good! AP & I tried another brand of coconut milk beverage that we came across at Aeon Big one day & it wasn't pleasant to the palate. This was smooth, not overly thick, not chocking, & I could actually finish a bottle on my own. As for the other brand, I actually used it to cook curry as it was really difficult to consume as a beverage! Hahahaha. This was nice! Fragrant coffee aroma & taste with a lovely blend of coconut. Interesting. I won't mind drinking this any time & I think it's good for those who are lactose intolerant, but love chocolate milk :P Chocolatey enough to make me want to drink it up. You won't realize you're chomping away on coconut chips if no one tells you it's coconut & if you don't see the packaging. This is ADDICTIVE! I'm not a fan of coconut snacks as it's usually fibrous & rough, but this felt like eating a nutty-chip. SO GOOD! Alike our Chinese peanut bars, this comes with roasted coconuts, raisins & sunflower seeds. It wasn't too sweet, very crunchy & I thought it's really fragrant. Wouldn't mind having these at home as snacks! For more information on the products, visit www.theblanccoco.com. Go natural, go Blanc Coco! 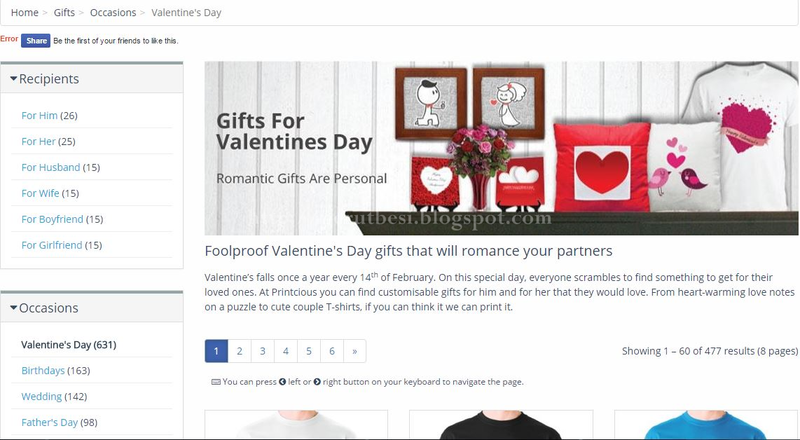 With advanced technology in this 21st century, Printcious provides everyone a simple platform to design & purchase personalized gifts for themselves & their loved ones. 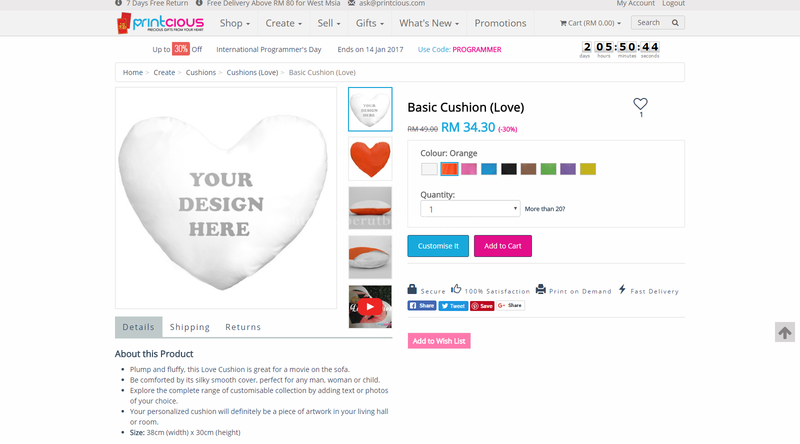 I find that buying & designing gifts on Printcious fun, simple & hassle-free, especially with such a busy schedule this 2017. There is an extensive list of product categories to select from & customize your gift. 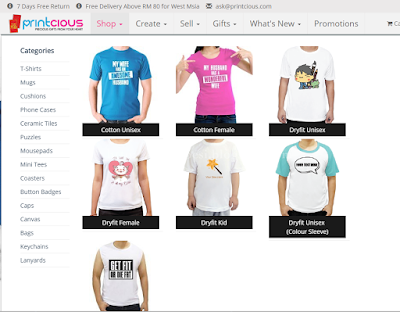 Shopping for a gift is indeed made complete at Printcious! As a "certified software tester" by profession, I decided to test out their customization tool to verify the ease of use as well as check out their user interface for the tool. I dare say that it's pretty easy to use, especially if you're familiar with using the computer, internet & online shopping! 2. Select "Categories > Cushions > Cushions (Love)"
3. 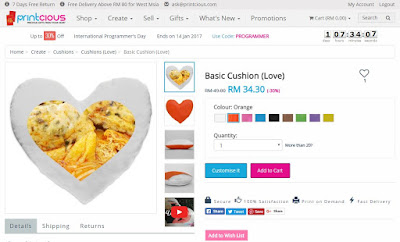 Select the Color for your cushion. 5. 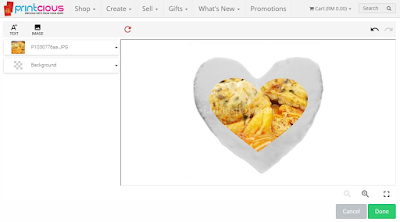 Click on the "Customize It" button to add a customized image/words. 6. 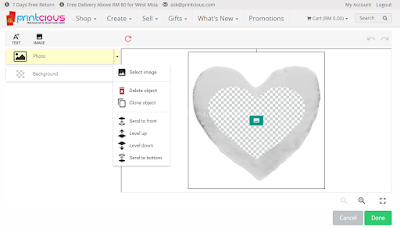 Click on the "Photo" drop-down button. 7. Click on "Select Image". 8. Select your method of choosing the image, whether it's by Uploading from your computer ("Upload Files") or selecting from an album from your Facebook/Instagram account. 9. Insert the image & click on the "Done" button. 10. If you're satisfied with your customization, click on the "Add to Cart" button. If you would like to add more customization e.g. words, click on the "Customize It" button again & repeat steps 6-9. 11. 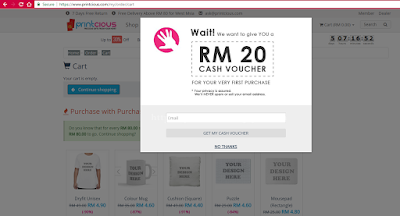 Click on the "Checkout" button. 12. Fill in your Shipping Address, Method, Payment Method & Review your Order before finalizing your order. Once confirmed, you can wait for your order to arrive! 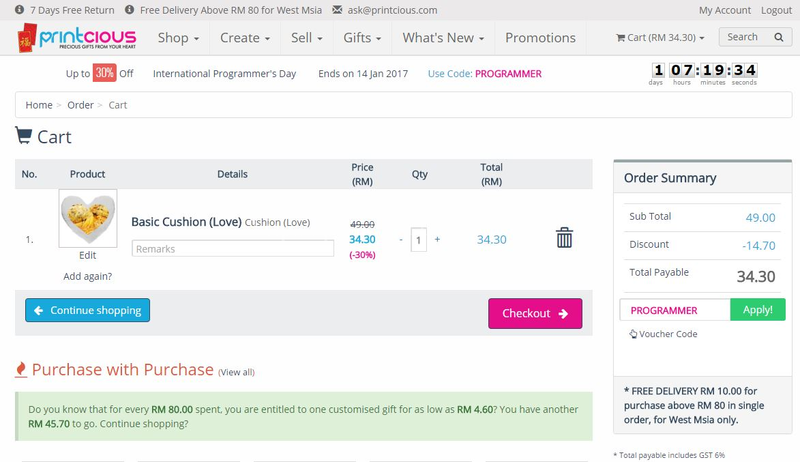 :) If you order above RM80.00 & you're delivering to an address in West Malaysia, you'll get your item(s) delivered for free as well! You can also select from their pre-designed selection of gifts for Valentine's Day. There are at least 477 varieties to choose from! Just go to the "Gifts > Occasion > Valentine's Day" page to begin browsing. 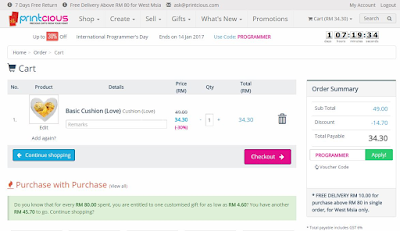 Currently, they are having a Back To School promo, which ends this Saturday, 21st Jan 2017. 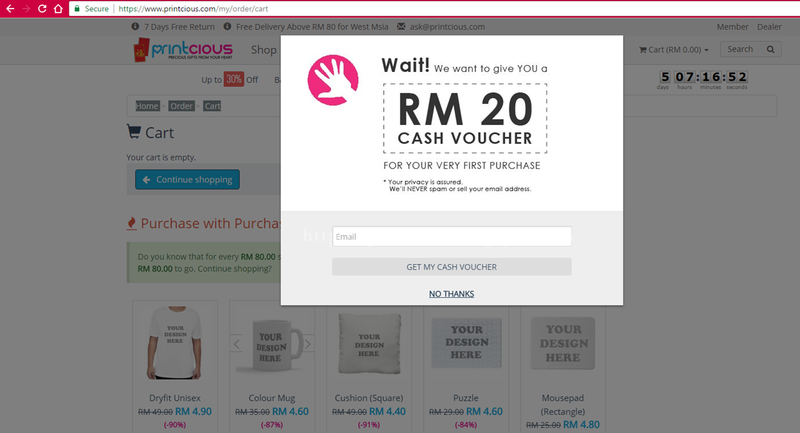 You can also receive a RM20.00 cash voucher for your very first purchase at Printcious! Valentine's Day is coming too soon! Tea has its benefits & nature has its ways of providing, sustaining, & restoring for itself, the way its Creator has purposed it to be. Fruit & flower teas are one of the "in" things now as more & more people are more health-conscious & looking at natural remedies for a healthier living. 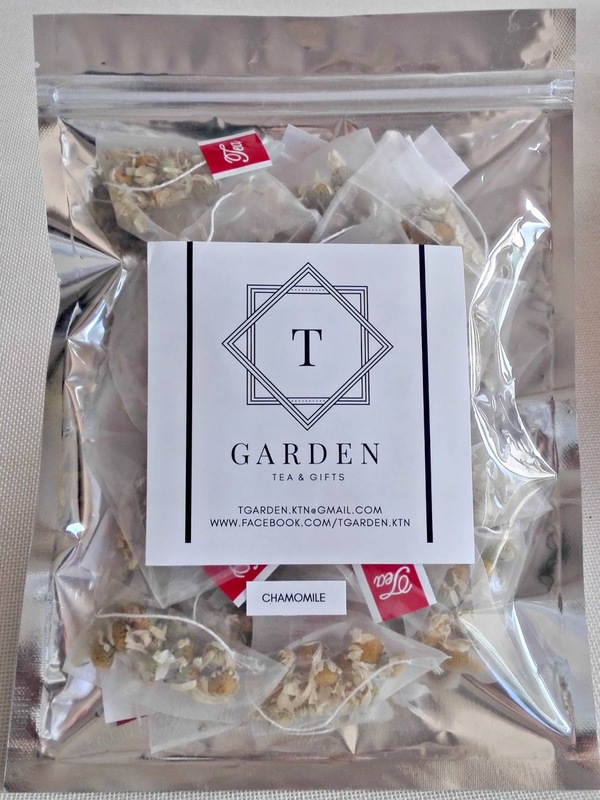 As the common Chinese/Ceylon tea leaves can sometimes cause selected individuals to stay awake through the night, fruit & flower teas are a good option for tea-lovers & those who are keen to draw benefits from these dehydrated/dried fruits & flowers. T Garden is a new brand in Malaysia since its launch last October 2016. 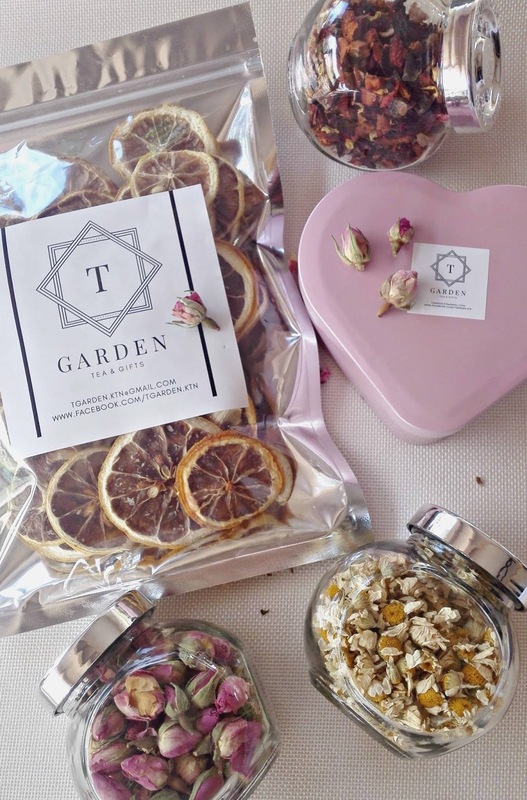 Started by a simple, tea-lover in Kuantan, this brand currently carries a variety of 11 fruit & flower teas. Their best seller is no doubt the blueberry tea, a fusion of blueberries, blackcurrants, grapes, hibiscus and rose buds, that is rich in vitamins & anti-oxidants. Some of the benefits include reducing the risk of diabetes, prevents dehydration, & boosts immunity. Best part is that all these fruit & flower teas are caffeine free! :) All their tea fruits/flowers are imported from Germany, & packed locally in Kuantan. Each fruit/flower tea has its benefits. 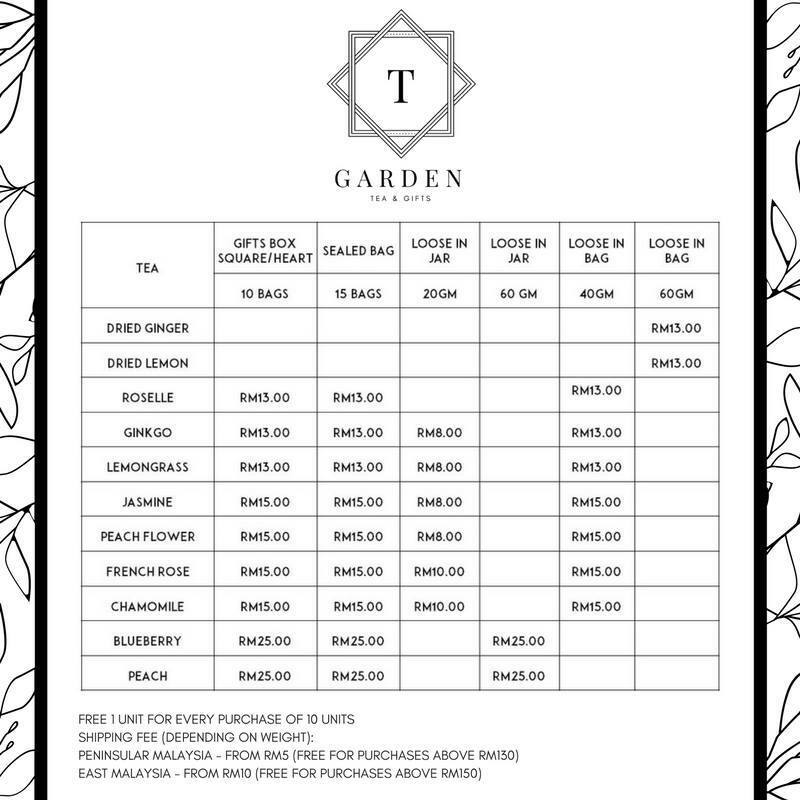 You can refer to T Garden's FB to read more about the health benefits & reap from the benefits that these teas give by consuming them regularly. For this review, I have decided to try out the blueberry tea first since it's their best seller (can't be drinking all 11 types of tea at ONE go for this review! ), just to check out how it really tastes & what's so special about it that most of their clients purchase this variety. I had the one in a tea bag, but to show you what exactly is in the bag, I opened the bag for photo purposes. The tea has a fruity & floral aroma. It has a tart, sourish taste, yet light & pleasant to the palate. One tea bag can actually last at least 2 cups & be enjoyed slowly. A colleague of mine who tried the same tea said that she keeps refilling her tea cup throughout the day as the taste of the blueberry mix is still evident even after several rounds of refilling. 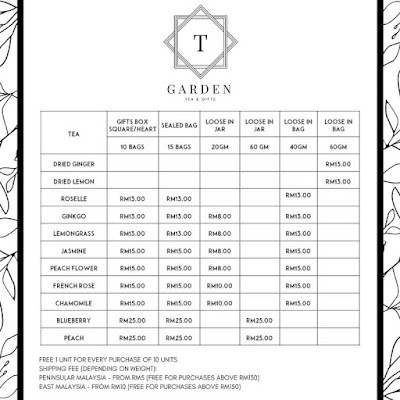 All of T Garden's teas are sold in the form of loose fruits/flowers/leaves or in sealed tea bags for convenience. Some people prefer to purchase the loose fruits/flowers/leaves as they have their own tea strainer or they prefer to put more tea ingredients into a large tea pot to be consumed throughout the day or by more people. 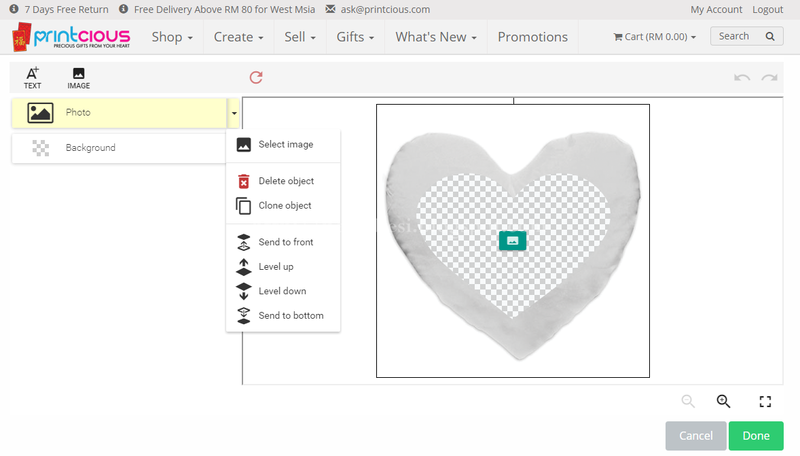 At present, the gift boxes come in baby pink heart-shape, light turquoise heart-shape, silver square & gold square. 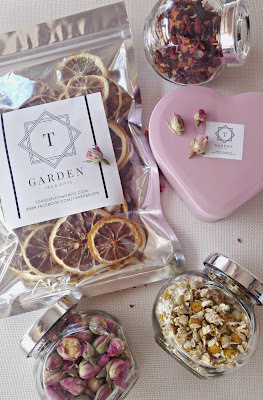 If you're keen to purchase packets/jar/gift boxes of teas to include in your gift bags or hampers, do drop them a Facebook message or email them at tgarden.ktn@gmail.com with your enquiries/purchase order. Their FB page also provides a step-by-step instructions to purchase the tea. Do indicate that you're PerutBesi's reader & you'll get some sample tea bags to try out as well (only from now 'til 11th Febraury 2017)!